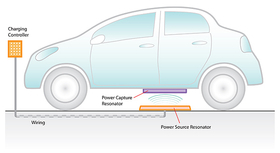 Inductive charging, a technology that lets EV owners recharge by simply rolling over a small pad in a home garage or public parking spot, will spread rapidly over the next 6 to 7 years. Premium carmakers will lead a move toward new wireless technology for charging electric vehicle batteries, a forecast by the global market analysis firm Frost & Sullivan says. Inductive charging, a technology that lets EV owners recharge by simply rolling over a small pad in a home garage or public parking spot, will spread rapidly over the next six to seven years, according to the forecast. It predicts more than 128,000 inductive recharging systems will be in use in North America by 2020, up from just a few hundred today. "This move will be led by the luxury brands," says Prajyot Sathe, Frost & Sullivan senior automotive analyst. "The primary reason for adoption will be convenience. With inductive charging, there are no cables or physical effort. You will simply park over a charging pad." Sathe anticipates that luxury cars will more easily absorb the additional cost of the charging feature. Some inductive kits are already available on the aftermarket, retailing for about $3,000 (2,207 euros), plus installation of the vehicle components. But automakers are now testing original-equipment inductive systems, including BMW Group, Volvo Car Corp., Nissan Motor Corp. and Volkswagen Group. In 2012, Infiniti showed audiences an EV concept sedan called the LE that would use inductive charging, but last year it delayed that project. At the time of the delay, company officials said they expected advances in inductive charging that eventually will benefit an Infiniti EV.